This hop-on hop-off bus tour of downtown Manhattan lets you sightsee in New York City at your own pace. Pass through neighborhoods such as Chinatown, Little Italy, Greenwich Village, take a stroll in Central Park, or stop to explore in Times Square. You’ll hear live commentary via audio headsets on board. 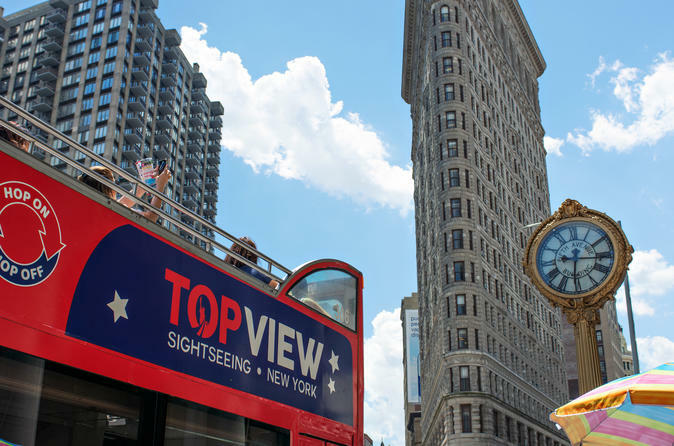 Hop on the double-decker bus in Midtown Manhattan and listen to live narration on the sights along this multi-stop Downtown route. You'll motor past historic landmarks including Times Square, Rockefeller Center, the Empire State Building, Flatiron Building, Union Square, Washington Square Park, and more. Hop off at any stop along the 2-hour loop to explore neighborhoods and parks at your own pace, then catch the bus to continue along the route. Visit Greenwich Village, NoHo, SoHo, Chinatown, Little Italy, City Hall, Battery Park, High Line, Garment District, Port Authority, and much more.